In this month’s local top story, time travel maybe. New reveals lead to some explanation into current happenings in this strange colorful world of our Paper Girls. Can some waking elderly man (and Public Enemy fan?!) have some foundation into these otherworldly happenings? Also more thrills, drama, action! The fourth issue in many fresh comics series often reveals a serious unfolding of a bigger picture. 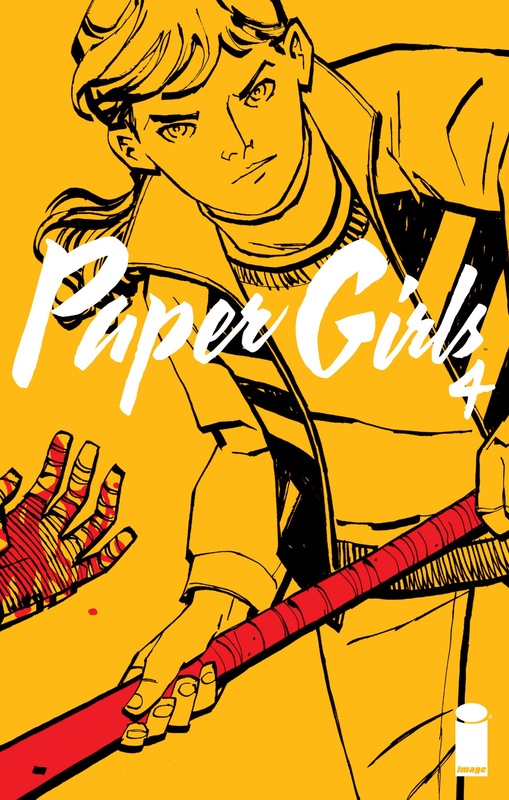 Though for Paper Girls, its more of an unraveling to that of the Fruit Roll-ups with peeling shapes; to which I enjoyed in my pre-teen daze. There was that sweet purpose of it all, to consume the rewarding sweetness while finding embedded shapes within (some to my imagination) with each unroll. I had something more than initially desired, to which my satisfaction expanded. Or in this case, a comic book story revealing a bit more with each page turn. We have new creatures, new concepts, new characters mixed in with the somewhat familiar by now. We got the new fleshing out of the two factions of visitors running about, something a bit more to their mannerisms, language and purposes though much is still left to mystery. We have new dangers, including a strange technological tentacle terror (the Editrix) within the deep. The giant bird creatures have grown on me quite, with their long beaks, necks; strong but not dangerous. 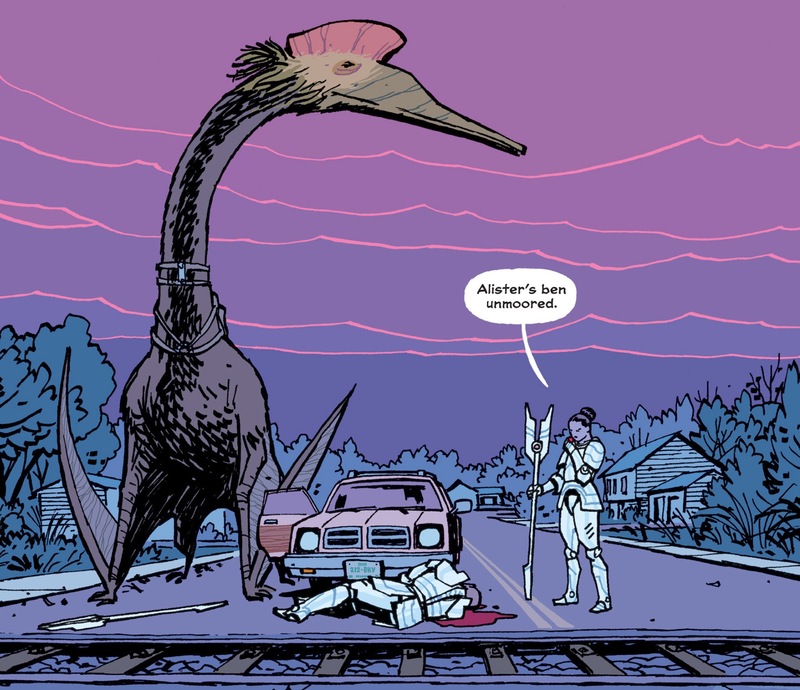 In the picture below, we have these interesting dangers brought to us I think best represented by the giant dinolike bird, yet a tiny man-made bullet that brought on the unmoored fate of poor Alistar. With the characters and creatures, we discover with them; especially the “teenagers” and their sensible explanation of time travel consequences. An understanding between two groups is intelligent, though still showing distance. Mac’s reaction is perfect for the sudden revelation to one male having a “boyfriend.” To which certain feelings are still a cultural norm of many today, I think the “effed up time” is referring to our modern times, still prevalent today…yet misplaced which we as a society are still growing. Mac’s youth and reaction (along with her friend’s counter reaction) I feel reflects that. This brings to mind and question, to how far ahead are our visitors and to what degree would we matter in our ever-evolving ways of thought. But then again, perhaps no choice but to trust. 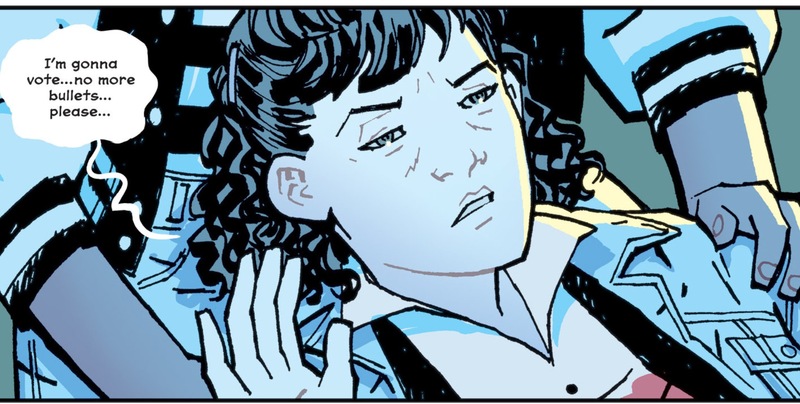 But there is a laughable degree to which I can’t take this world of Paper Girls too seriously. that’s a good thing. Meanwhile, we don’t get as much in major character development (more like reinforcement). That’s okay, as we need a little time to take back and breathe in the crazy developments. However, I loved the moment where Tiffany lives through a mundane “hell” as she relived her past in wasting her time away playing an Arkanoid style game. I would fondly welcome any chance to relive my first experience playing Blaster Master or the first Legend of Zelda on the old Nintendo system, both wasting in time but with no regrets. That whole sequence, is a fantastic showcase of sequential art. The colors, screen, intensity of colors, angles, all work fantastic together in a moment suitable for framing. I loved every panel of that, and can almost hear the beeps. That art as usual, continues to present the best sugar to this overall treat. Not much more said, than already in past issues without continuing to feel like I’m gushing too much. 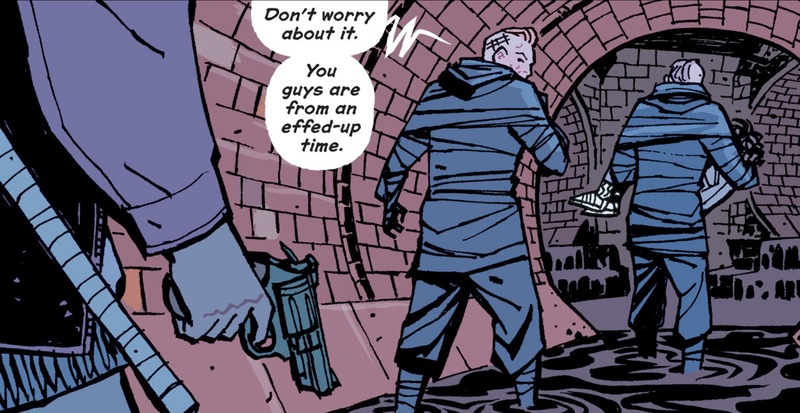 As long as the great work is kept up by Cliff Chiang and Matt Wilson, than I shall stick around. 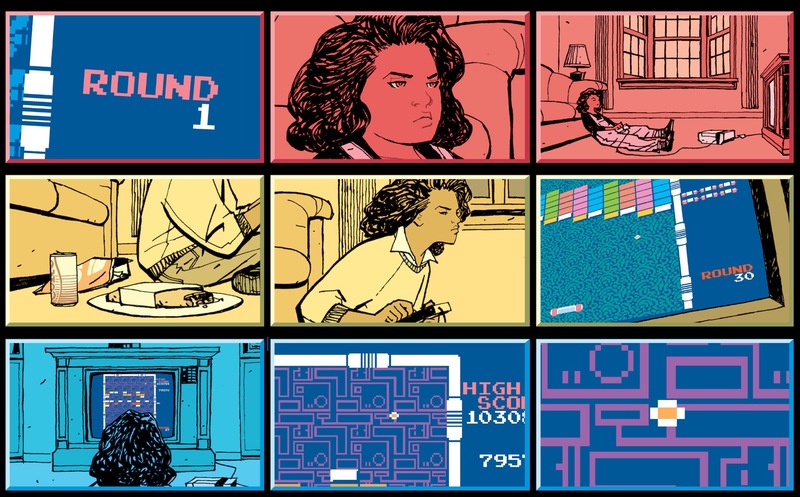 So, I enjoyed my sweet fruit roll-up reading of this Paper Girls #4. I look forward to the next issue, and the peelings apart within.